Amid the injury crisis at Arsenal, Unai Emery is set to welcome a player back to the team for the Carabao Cup clash. The Gunners go into the game with two of their main left backs out injured and even though Sead Kolasinac has returned from injury, he is unlikely to make it into the team to lock horns with Blackpool on Wednesday night. Granit Xhaka had been the one deployed at left-back in Arsenal's last two games which were with Sporting Lisbon and Crystal Palace in the Europa League and Premier League respectively but the Swiss international will most likely be placed on rest in preparation for the weekend's big clash against Liverpool. Ainsley Maitland-Niles, another player who has just recovered from a knee fracture could be fit in time to feature in Arsenal's next game. 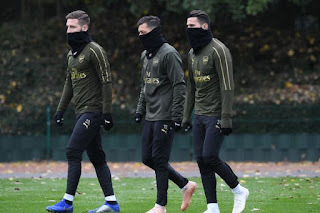 The boss is expected to feature a host of youngsters in that game as we saw the likes of Emile Smith Rowe, Eddie Nketiah and Joe Willock in training at London Colney with the big boys.